The Cafe’s lively and casual atmosphere is the perfect place to enjoy lunch, dinner, or a late night appetizer. In the summer months we open our doors and windows to our outdoor Patio and lavish landscaping to offer you the best of both worlds. Our extensive lunch and dinner menus offer classic and contemporary American dishes featuring fresh seafood, succulent steaks and more! The Cafe is the perfect place to dine with family, friends or coworkers. The Cafe Escadrille’s Famous Mahogany Bar has a new look with a more open feel, making it the perfect spot for meeting friends after work, catching a bite and the game on one of our HD TV’s, or unwinding with a refreshing drink at the end of the day. 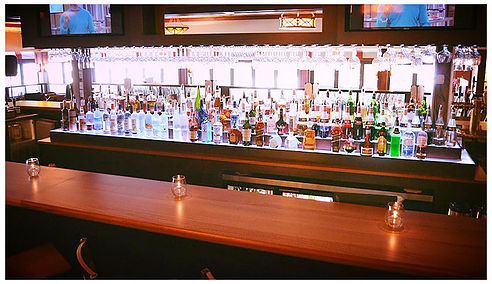 Our bartenders are expert mixologists and have at their disposal an extensive wine list with selections to please even the pickiest connoisseur, a Scotch and Whisky list that is second to none, and our ever changing craft beer list with choices ranging from light refreshing lagers to full bodied stouts. Our Lafayette Room is a small private dining area overlooking our main dining room, which gives you the lively atmosphere of the restaurant, while allowing you the privacy you’re looking for to celebrate your special occasion. The room comfortably fits a range of party sizes, from 12 to 24 people. Cafe Escadrille’s outdoor patio is a great casual dining option with a relaxing atmosphere. Enjoy a wonderful meal under our shady umbrellas, or an evening cocktail upon our comfortable patio furniture. With lunch, dinner, and late night menus available, the patio is a great dining experience no matter the occasion. Cafe Escadrille has a full Sushi Menu prepared fresh by our highly skilled Sushi Chefs. See more here.